The Fraser spiral illusion is an optical illusion that was first described by the British psychologist James Fraser in 1908. The illusion is also known as the false spiral, or by its original name, the twisted cord illusion. In this illusion, overlapping black arc segments appear to form a spiral; in reality, the arcs are a series of concentric circles. Although the Fraser spiral illusion and other similar illusions have not been completely explained, they has stimulated much valuable research into human perceptual processes. They have also been utilized by artists to bring about entertaining and impressive effects in their works. In all the hitherto published visual illusions of direction, with the exception of the Chequerboard or Münsterberg illusion, the illusory lines or bands are definitely continuous, uninterrupted in character of black or white, on a contrasting background. In the illusion of direction here described each illusory band consists of a series of visibly discrete similar parts, all inclined at the same small angle to the line of direction of the series to which they belong. Such visibly discrete similar parts may be conveniently termed 'units of direction'. 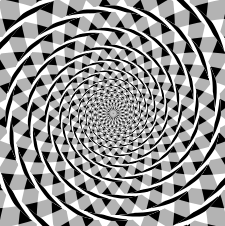 When looking at a Fraser spiral, one sees what appears to be a spiral of twisted rope against a checkerboard pattern. In reality, the arcs that make up the "spiral" are actually a series of concentric circles. The visual distortion is produced by combining a regular line pattern (the circles) with misaligned parts (the differently colored strands or "twists"), an effect that is augmented by the spiral components of the background. The Zollner illusion and the cafe wall illusion, like many other visual effects, are based on a similar principle in which a sequence of tilted elements causes the eye to perceive an image incorrectly. The Fraser spiral illusion, along with other similar phenomena, is created by the way the retina and brain process the images. The Fraser spiral, like other perceptual illusions, is useful in the study of perception and vision. The way optical illusions are perceived in the brain gives researchers information regarding how images are processed and interpreted. Such effects are also utilized by artists to intriguing images that fascinate and entertain the public. ↑ Fraser, James. 1908. "A New Visual Illusion of Direction" British Journal of Psychology. Retrieved October 30, 2007. Fraser, J. "A New Visual Illusion of Direction." 1908. Brit J Psych, 2:307–320. Morgan, M.J. and B. Moulden. "The Münsterberg figure and twisted cords." 1986. Vision Research, 26:1793–1800. History of "Fraser spiral illusion"
This page was last modified on 9 May 2017, at 15:16.